Our phones and tablets keep changing, and our accessories usually need to change, too. But iZel was created all the way back when the very first iPhone debuted. Its simple, smart design has endured, making it a universal stand for smartphones and many tablets. The adjustable, easel-like legs hold your device securely. Flexible but sturdy, the design lets you switch between portrait and landscape placement. With the kickstand, you can adjust the viewing angle, too. When you’re done, the stand folds flat, making it perfect for travel. 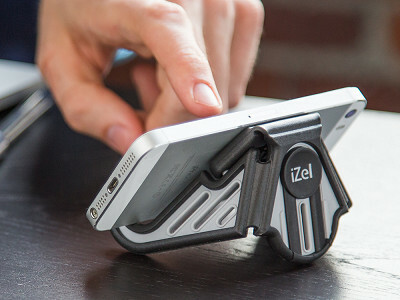 Founder John Bandringa called on his product design experience when he invented iZel in 2008. It’s thoughtfully engineered and well-made right here in the USA. This stand is still as practical and useful as ever. Hello everyone! I'm proud to introduce Movaic to The Grommet. I'd be happy to answer any questions you have! does this stand work for iPad Pro? The stand is designed for a large array of smartphone sizes and thicknesses, with or without a protective case. As screen sizes have grown, we have found that many of the e-readers and smaller tablets have worked very well too. When we get into the larger tablet dimensions, they start to exceed the stand’s capacity. While they will fit, stability might become an issue because the tablet is so tall. Is the Movaic adjustable up to the vertical position? The stand is adjustable to near vertical with the surface of your screen tilting back approximately 15 degrees. It then can be adjusted to your liking with six different increments that will take the screen to a maximum angle of roughly 40 degrees. We’ve found that people like the smaller angle for use on a bed side table for example, or the larger angle for an airplane tray table. Thanks for your question. While we have many customers that use the stand for their 10” tablet and are pleased, I personally feel the 10" size is where we start to push the limit in stability. If the 10” tablet is being used in landscape mode and you’re viewing it on a kitchen table for instance, hands-free reading or browsing may be okay for you. If you’re on a train, for example, and using it on a tray table where the train is going around corners, the stability may be an issue with the 10” tablet. The real sweet spot in this design is for all of the smart phones including the latest ones with larger screens and the mini tablets or e-readers. I hope this helps. John. Does the material that is used on the perimeter of the stand have enough "stickiness" to allow the stand to be used on a car dashboard - with or without a gripper pad under it? To me, the stand looks ideal to prop my phone up for the occasional call I need to make or answer while driving. My wife uses hers on a flat section down by the gearshift in her car. While the rubber will probably provide adequate surface traction, it’s the bumps in the road, sudden stops, or hard corners that make me anxious. This stand relies on simple gravity to hold the phone in place which works well on airplanes, trains, busses, and stationary surfaces. As you have probably seen, there are other ‘holders’ designed specifically for use in the car; but they are typically limited in their function outside of the car and they are often too bulky for a purse or a pocket. Is it able to hold phones or tablets that have cases, such as the life proof case? Yes, the stand was designed to accommodate phones with and without thicker cases. My daughter has a protective case that has an additional battery and it fits very nicely. There are two surfaces on the stand where your device can rest. As you can see in the pictures, the “U” shaped area lets the device nestle in to the stand. Additionally, there is a flat section on top of the “U” shaped area where ultra-thick items can rest. We’ve seen customers propping up all sorts of non-smart phone items using that flat feature. Our phones and tablets keep changing, and our accessories usually need to change, too. But iZel was created all the way back when the very first iPhone debuted. Its simple, smart design has endured, making it a universal stand for smartphones and many tablets. The adjustable, easel-like legs hold your device securely. Flexible but sturdy, the design lets you switch between portrait and landscape placement. With the kickstand, you can adjust the viewing angle, too. When you’re done, the stand folds flat, making it perfect for travel.